For those who came to the Justice Revival's free opening night program (featuring former United Methodist District Superintendent and Texas State House Rep. Dr. Zan Holmes and Latin Grammy-winning gospel musician Jaci Velasquez) the spirit of a "Big Tent" was certainly felt, with mainline Protestants, Catholics, Evangelicals, Spanish-speaking congregations and non-denominational mega-churches uniting from south Dallas (predominantly non-white and low-income), Highland Park (one of the Lone Star State's wealthiest towns), the downtown core, and suburbs to worship side-by-side. Leaders chose to steer clear of the most politically charged and potentially divisive issues like abortion and immigration, instead rallying all around a two-plank platform: housing and education. The goals -- while revolutionary since they've never before been stated by Dallas's Christian leaders -- seem reasonably modest and attainable: 700 units of permanent supportive affordable housing for the chronically homeless and working poor (a critical need which already has the support of Dallas's City Council and Mayor Tom Leppert, who also addressed Tuesday's crowd) and supportive partnerships with 25 Dallas-area public schools. Dr. Holmes' prescription to cure Dallas's ills included an additional topic that wasn't on the Justice Revival agenda -- health care. In his rousing sermon, Holmes' diagnosis began with the need to "name our disease, ... name our failure to come together" head-on, saying naming is a first step "on the way to overcoming it." 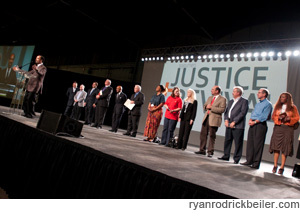 Acknowledging the legacy of two interfaith organizations no longer in existence, Greater Dallas Community of Churches and Dallas Together, Holmes called for a "fresh encounter with Jesus," connecting historical faith-based support for the 20th-century Civil Rights movement with the Justice Revival call for 21st-century Christian activism and advocacy. Though chairs occupied by registered attendees were flanked by many empty seats, and an altar call drew about two dozen people to the stage, the pastor of one of the city's largest churches, Dr. Frederick D. Haynes III charged those departing to send e-mails and post on Facebook pages in hopes of getting more people to attend the next two nights. None in attendance could ignore the clarion call for Christian sisters and brothers to change our city of Dallas by first examining our faith and closing a divide between our beliefs and our actions. Holmes described the disconnect between charity and justice as treating symptoms rather than finding a cure. Whether or not Christ-followers in Dallas have hearts open to following the doctor's orders remains to be seen. Dallas native Catherine Cuellar is a multimedia journalist and community activist. Find her at CatherineCuellar.com.